We are so grateful to the almost 60 volunteers who came out to enjoy and beautiful weather and participate in today’s big clean up event! 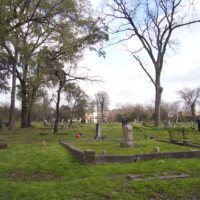 Through the efforts of these individuals and organizations we were able to fill two dumpsters with trash and debris, cut the grass, dispose of unwanted limbs and leaves, and get the cemetery looking great ahead of the spring growing season. We would also like to offer our congratulations to Paul Jennings, winner of our raffle! Paul won 2 one-way tickets (or one round-trip) on any Southwest domestic flight. Thanks to everyone for all of your support!